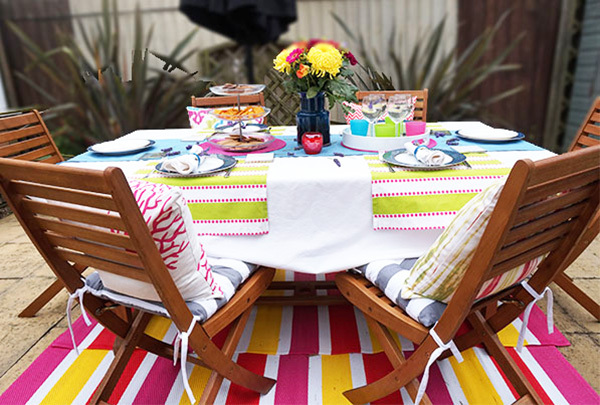 London Interior Designer and Mom, Karolina Barnes has joined us today to share her lovely backyard BBQ along with her TOP 5 TIPS for entertaining in style… and with kids! 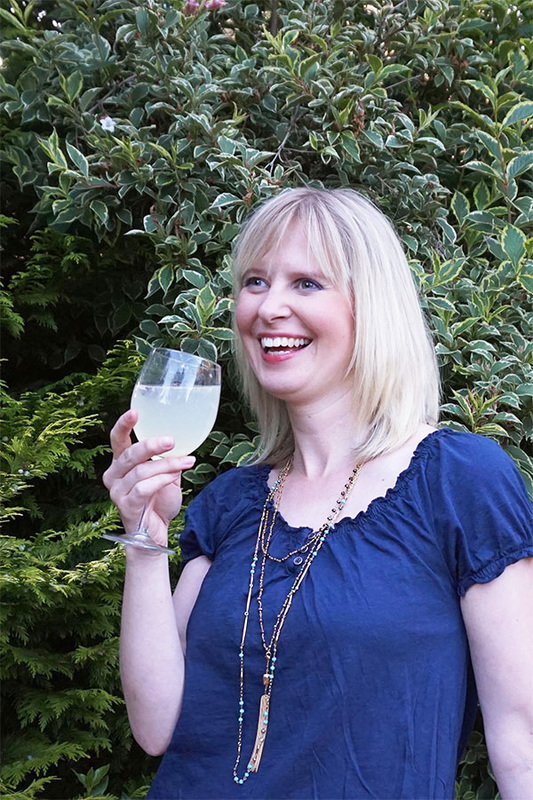 As a mom she’s mastered juggling hosting preparations with looking after the children, all with ease and grace. 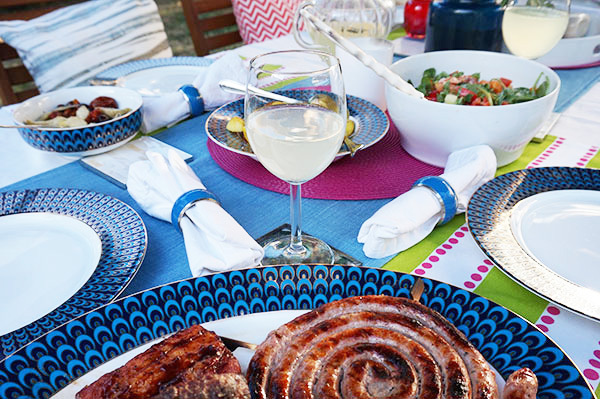 Not to mention, she’s a designer too so her backyard BBQ is both stylish and infused with vibrant colors! 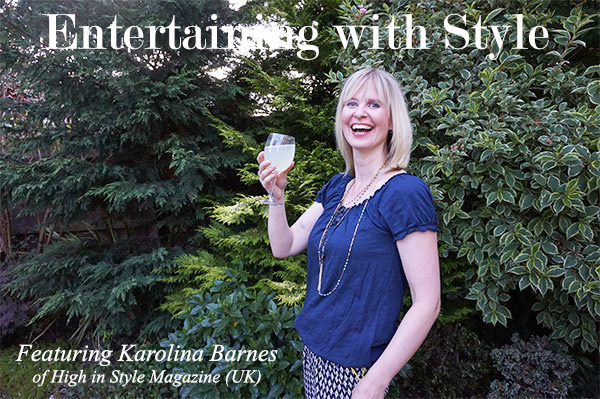 Karolina’s tips aren’t just for those of you with children though, but really for everyone. 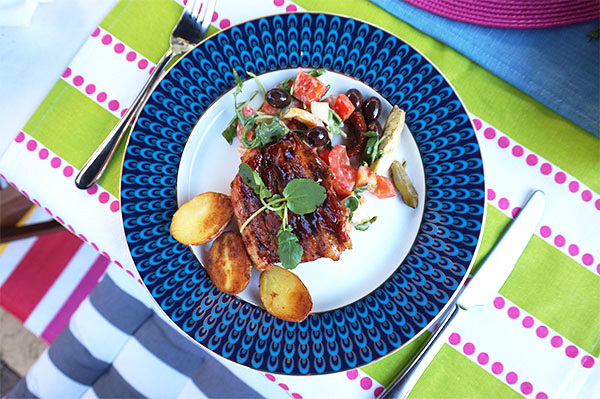 Take a look at this family-friendly BBQ filled with loads of English-charm and plenty of color, hosted by Karolina Barnes of London. 1. Approach your outdoor decor in a same way as your indoor. This means starting with a colour scheme of at least 4 core colours and working around them. In my case I started with the outdoor Ikea rug which added fuchsia pink and yellow. I also included green and blue décor as accents. I managed to pull those colours together through the cushions on the seats and dinner plates. 2. Use textures and bold patterns. I like using colours, textures and patterns to inject some personality into the space. 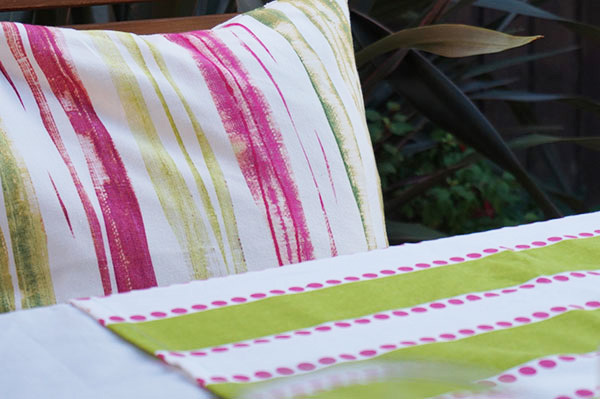 Bold colours in particular go really well against the greenery in your garden. Mixing patterns such as stripes, chevron and ikat (on my cushions) also makes the space more vibrant and individual. I purposely didn’t want to create a matchy-matchy feel so I used different cushions on each chair but in the initial colour palette I started with. 3. 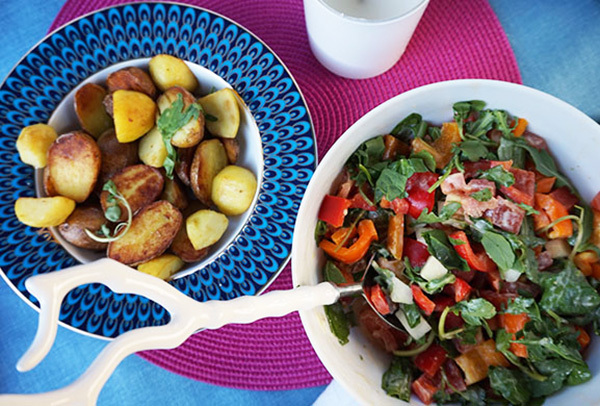 Use layers in table dressing. 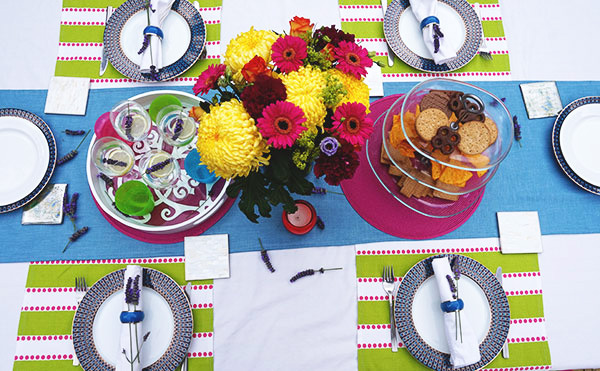 If you have kids around, keep your table setting to its minimum. I like to start my table with a white table cloth since it provides a nice clean, elegant backdrop which is very easy to build upon. Use flower pots and urns as a centre piece. It will be a very nice touch. Also, if your kids are old enough, get them involved in your preparations and special event. 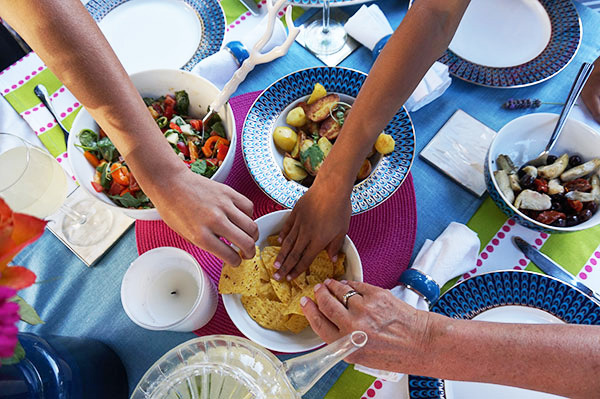 They can help prepare the food, set the table, or even just pose for great family photos! Think practically. In my case, instead of placemats, I used table runners which I layered over one another in crosses. To make my table more interesting, I used two different types of the table runner. 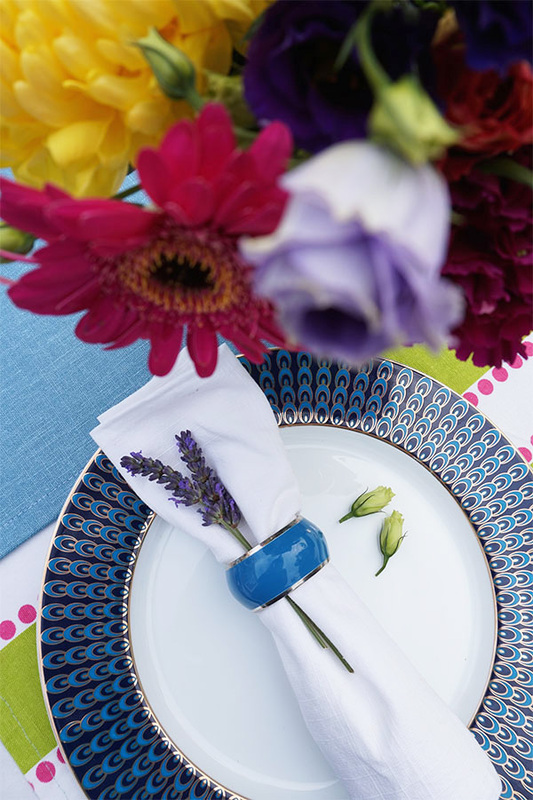 One was plain blue in glazed linen running through the centre of the table, and the other two were in bolder green cotton with fuchsia pink dots running vertically on either side of the table. 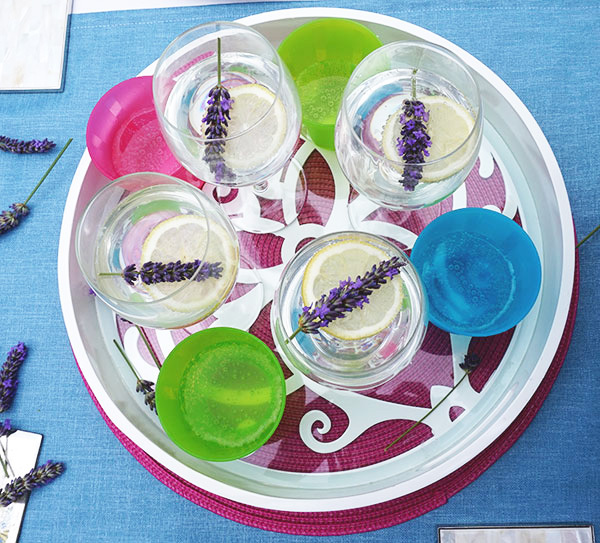 A lovely way to spice up your dining table! 4. 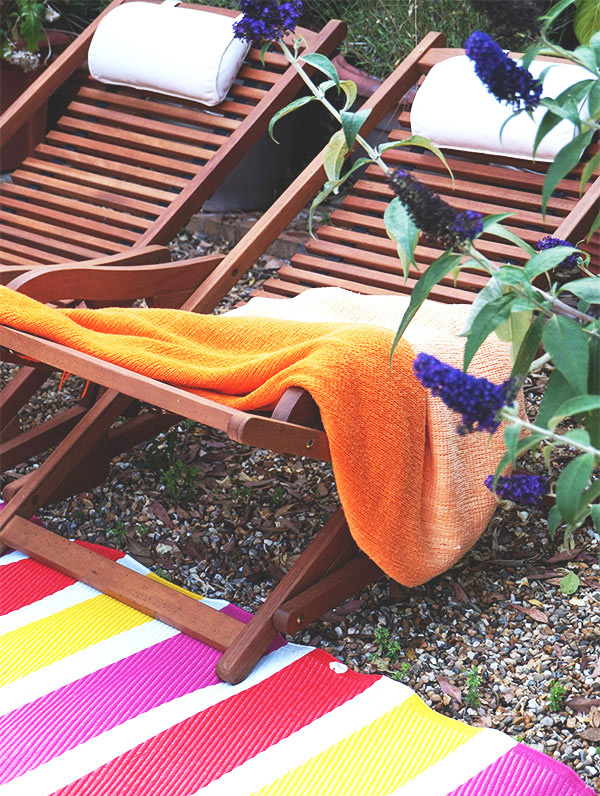 Invest in quality outdoor furniture. I would recommend investing in the best quality outdoor furniture you can afford (see above). Teak, eucalyptus and other hardwood can withstand harsh weather conditions throughout the year. Teak in particular is very durable and hard-wearing. Teak’s initial honey colour gradually changes to light silver grey, which has absolutely no effect on the longevity of the furniture. If you prefer keeping it in the nice honey colour, use teak sealer to revive it once in a while. 5. Forget about perfection and just enjoy it! Entertaining with kids is not always easy. Especially when you have to be the host, while manning the kitchen or BBQ grill and looking after the kids at the same time. It can get very stressful. But my advice is, don’t try to make things perfect. As long as the food is good and everybody is having a good time, you can give yourself a pat on the back. As a bonus, Karolina has shared her daughter’s recipe for Strawberry Meringue Nest, which she served at her recent BBQ. I’ve included her delicious yet simple recipe below. 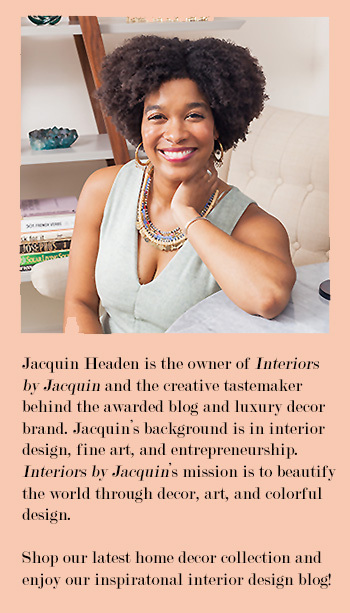 To learn more about Karolina or to check out her UK-based interior design services, please stop by her website here. Happy Friday! Strawberry meringue nest with cream – super easy summer dessert! First gently cook your cut strawberries with one table spoon of caster sugar and one spoon of water until you have a nice thick sauce with soft strawberries pieces running through it. After it cools down, whip the cream with a third of the strawberry sauce so that it’s nice and light pink. 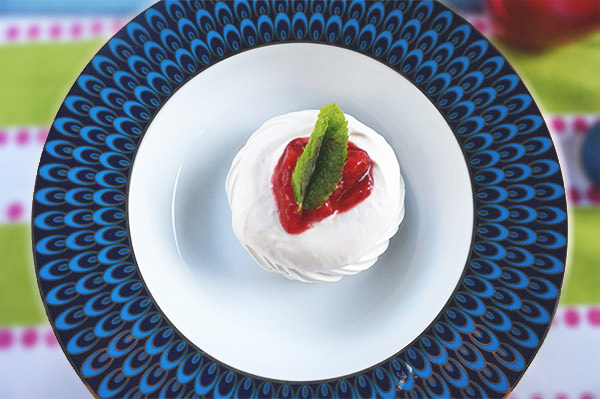 Spoon the whipped cream on the meringue nest and decorate it with the remaining strawberry sauce and a mint leaf. Voilà!